I recently switched from Windows to Mac. One of the things that's really ingrained in my muscle memory is hitting Alt+D in a browser to go to the address bar. On Mac browsers, ⌘+D creates a bookmark, the equivalent to move to the address bar is ⌘+L. I've used the Keyboard pref pane to remap ⌘+D to the "Open Location..." command in Safari, Chrome, and Firefox. In Safari this works great. In both Chrome and Firefox, hitting ⌘+D now goes to the address bar and creates a bookmark. Is there any way to get this to work properly in Chrome and Firefox? You can achieve this using the keyboard prefs just as you were trying. You simply need to create one more shortcut. By setting an explicit shortcut for Bookmark This Page... you get rid of the conflict an ensure there aren't two menu options with the same shortcut. Unfortunately none of the extensions I have work. However, there is a way to do this in the version of OSX I'm using, at least. Go to Settings->Keyboard->Shortcuts, and then from the list on the left select "App Shortcuts". Click "+" to add a new app shortcut and then select Google Chrome from the list of Apps. Now, you must assign "Bookmark This Page..." to something else first so that you can truly override command+D. I chose to select shift+command+B. After that click "+" again, and assign "Open Location..." to command+D. Now it should work. I can't believe how long it took me to find this answer, I guess everyone else uses Alt+L or Firefox. Thanks to Pysis for their answer here. Edit: This was so frustrating I made an account just to respond to this. 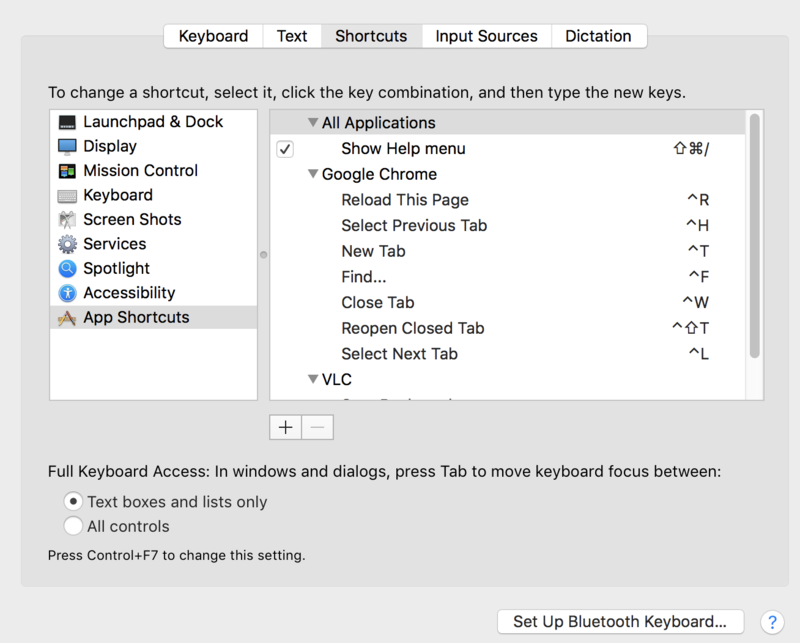 Here's an article on remapping keyboard shortcuts for Firefox. You'll need the keyconfig extension. Not the answer you're looking for? Browse other questions tagged keyboard google-chrome firefox switching .